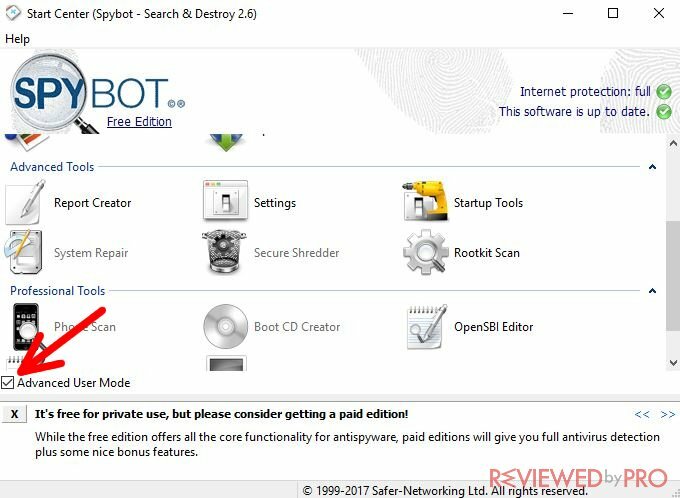 This is a short description – user manual on how to use SpyBot – Search & Destroy on your computer. 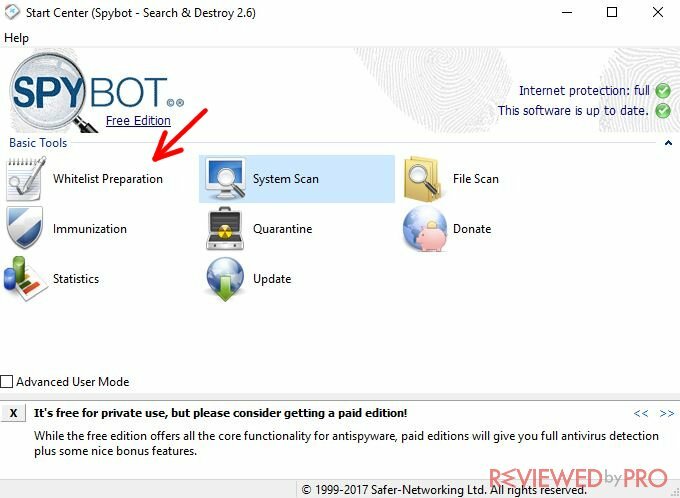 By following these steps, you will learn how to use this software, scan your PC and remove found threats from your computer. Note: this is an installation guide prepared for Windows 10 operating system. By following these steps, you will learn how to use this software, scan your PC and remove found threats from your computer. Note: this is an installation guide prepared for Windows 10 operating system. First of all, download the installation file from this page. 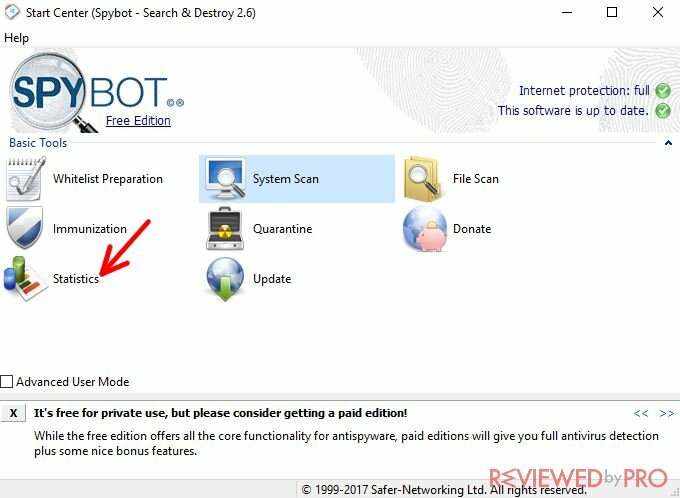 You will be asked if you are sure that you want to download a file named “SpyBot-2.6.exe”. Press the button “Save a file” and you are ready to go further. 1. 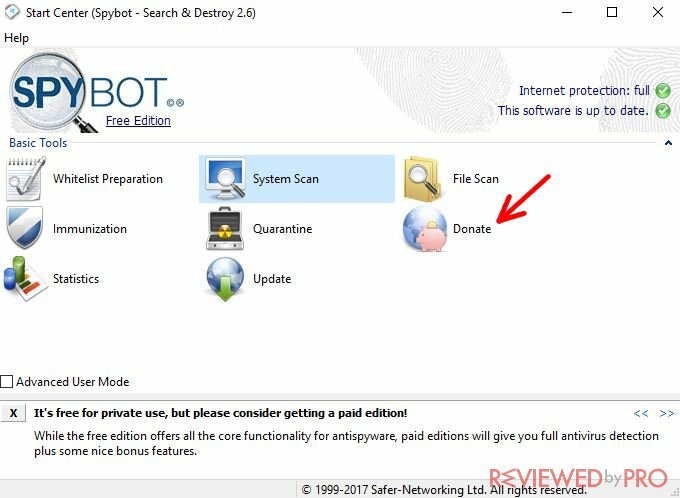 Once the download is complete, open the installation file located in your download directory, which is named as “SpyBot-2.6.exe”. Press the left mouse button and the installation process will begin. 2. A pop-up window will appear and you will be asked if you are sure you want to install this file. Press “Yes” to go further. 3. On the next window, you will see the welcome screen where you must choose the installation language. Choose English and make sure you press “Ok” as it is shown in the picture below. 4. 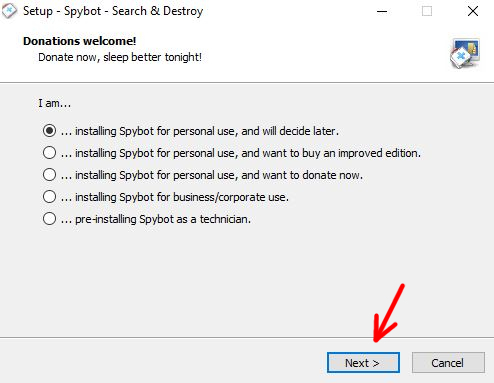 During the next step you will need to explain why you are installing this software, so just check an option which fits your needs and go further by pressing the button “Next”. 5. 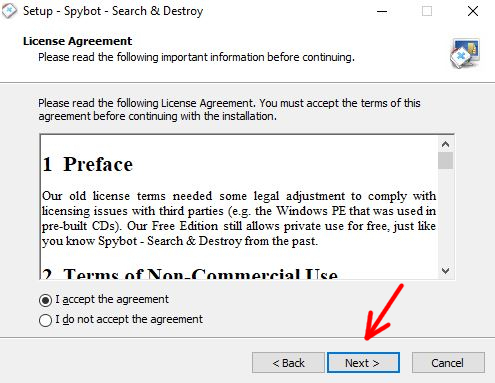 Now you will see the License Agreement for the application. Read it and then click “I accept the agreement”. 6. 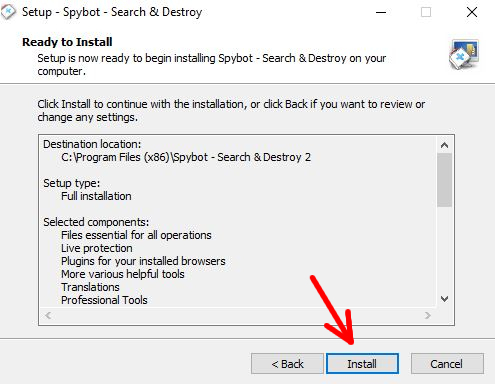 Now you will simply see an installation window, on which you have to press “Install”. 7. 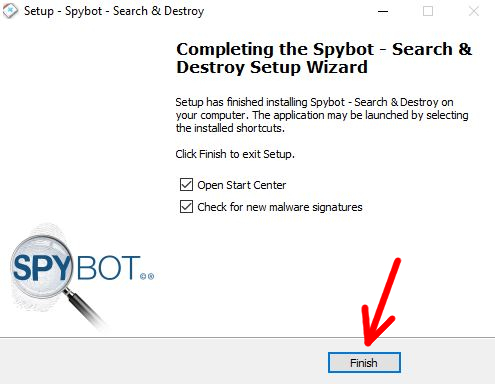 This time you have to click on “Finish” because this is the last step of SpyBot installation. Less than one minute, and you are ready to scan your computer! Whitelist Preparation – here you can choose, which folders or files you don't want to scan in order to speed up the scan. System Scan – click here in order to start scanning. File Scan – with this tool, you can scan only the files selected by you. Immunization – this tool blocks the access to websites that can contain malicious software. Quarantine – in this section you can see the quarantined files. If, for example, you trust the file, you can restore it from here. Donate – if you are using the free version, you can show your appreciation to the developers by donating them money. Statistics – all the data about scans, quarantine, immunization, etc. Update – click here to update your anti-malware tool to the latest version. Advanced Tools – these options should be used by advanced users who are familiar with computer settings. You can see “Report creator”, “Settings”, Startup Tools”, “System repair”, and so on. Professional Tools – here you can see Phone Scan, Boot CD Creator, and other professional options. Most of these are available only to paid users. It is quite easy to scan your computer with SpyBot – Search & Destroy. First, you need to press on “System Scan”. 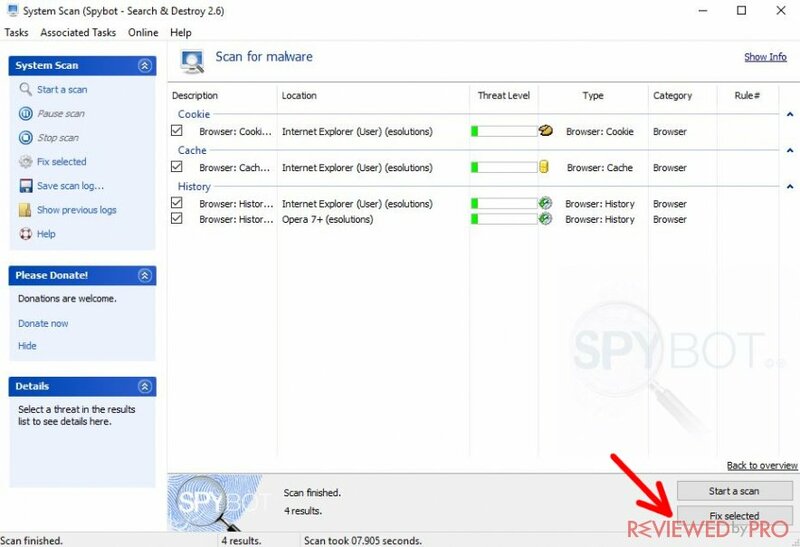 A new window will appear where you have to click on “Start a scan”. Now you have to wait until the application finishes scanning. This may take a while. 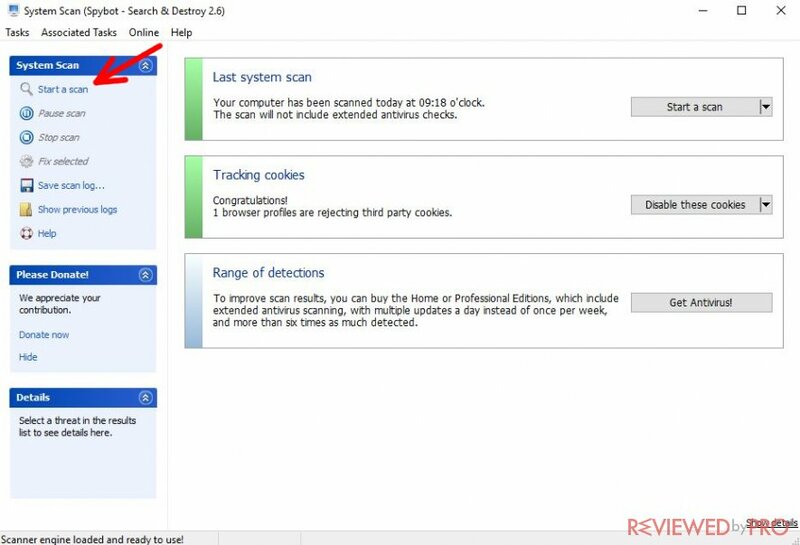 When the process is complete, you will see the list of detected threats. Hit “Fix selected” if you want to get rid of all the malicious files. 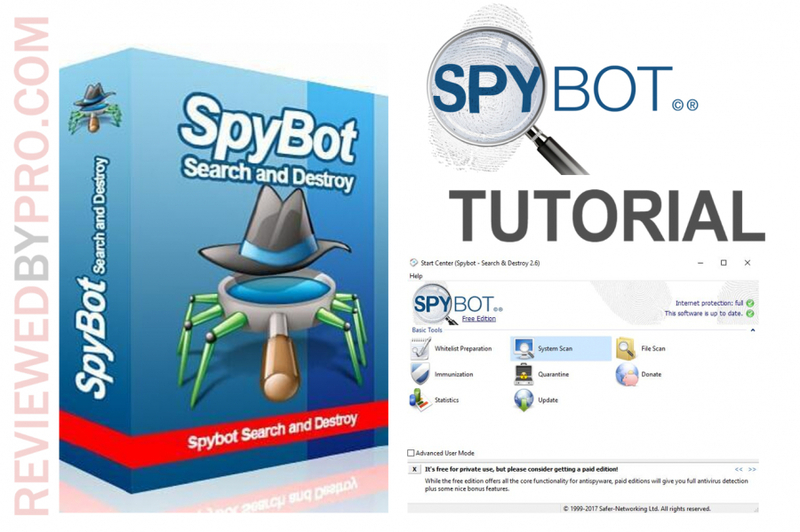 You can download the full version of Spybot – Search & Destroy from this page. There are two paid versions – Home and Professional. Both have extra features that the free version lacks.